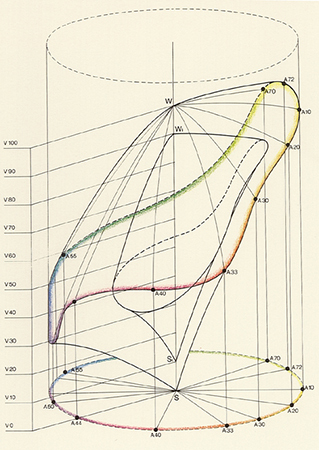 In 1975, the Dutchman J. Frans Gerritsen made a fresh attempt at arranging colours according to the laws of colour perception. 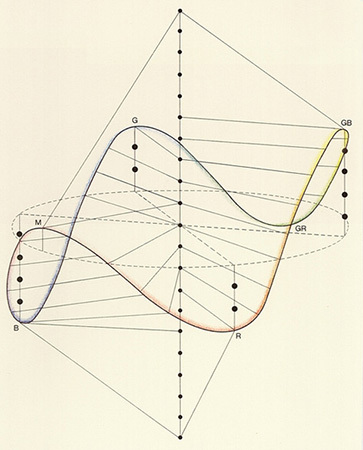 He selected three variables — colour-hue, brightness and saturation — and, as with the Coloroid system, organised them within a cylinder, on the wall of which we can see an irregular wave line formed by colour-hues arranged in a circle at their alternating higher or lower levels of brightness. The colour-circle comprises six so-called full-colours identified by Gerristen as yellow, red, magenta, blue, cyan and green. He arranges them in such a way that complementary pairs lie diametrically opposite each other, with three brighter colours alternating with three darker colours. All conceivable primary and secondary colours can therefore be placed both on the cylinder wall and on the wave line. Gerritsen identifies the achromatic colours running from white via all the grey tones to black as tertiary colours. These form the colour-cylinder’s brightness axis, which is given the graduations A to J. The two illustrations show vertical and horizontal sections through the perceptual colour-space as shown to the left. Horizontal sections exhibit colours of the same brightness. Gerritsen wished to use his model to rediscover some of the old laws. Indeed, in his Evolution of Colour Theory (1984) he writes: «As with the Greeks, colours are once again arranged at individual brightness levels between black and white. Red as a ‘mixed colour’, once believed to occur between black and white, is found on the outer circumference between black and white. Newton’s colours of the daylight spectrum are given their rightful place. As in Maxwell’s colour system, the basic colours alternate — three brighter and three darker. The irregular wave line running around the cylinder wall and joining individual points of full-colour brightness permits regular gradations of brightness and colour». In addition, Gerritsen selects his system so that we can recognise the opponent-values black-white, blue-yellow and green-red as signal transmissions within the process of colour vision. In this respect, Gerritsen has definite ideas about the evolution of the visual sense throughout human existence: at the initial stage, it was only possible to register information about darkness or brightness, and there was just one black-white opponent-signal; the second stage witnesses the evolution of sensitivity to the opponent-signal blue-yellow, with sensitivity to the red-green opponent-signal emerging in the third stage. Here, yellow assumes the same role for the colour-pair red-green as white for blue-yellow: namely, the neutral point of transition. This idea about the phylogenetic emergence of colour sensitivity can be traced back to the physicist Erwin Schrödinger who, in 1924, had already reflected «on the origin of sensitivity curves within the eye» in order to achieve a better understanding of the psychology of colour order. Schrödinger not only makes it easier for us to grasp that white and yellow are «genuine basic perceptions» — one from the monochromatic and the other from the dichromatic stage of evolution — but he also has an explanation for red-green colour blindness, the most common impairment to human colour vision: supposedly, it corresponds to a classic atavism of the photopic organ. Scientists, however, have come to explain the occurrence of colour blindness from another perspective: genetics. Modern biology has succeeded in identifying a few genes which contribute to colour vision — to be more precise, genes which carry the biological information on the colour pigments within the eye which receive and relay light to the brain. Three different genes have been located, which are responsible for three pigments of blue, green and red. For simplicity’s sake, we shall here talk of blue, red and green genes. While the blue gene is accommodated remotely from its two companions in the genetic material of cell structures, the red and green genes are adjacent. During the normal genetic mechanism of cell division, mixing («crossing over») of these adjacent genes can occur, leaing to their ineffectiveness. The likelihood of such crossing over is increased by the surprising fact that, while there are numerous green genes, there is only one blue and one red gene. Red-green colour blindness can thus be very well explained from the genetic point of view. 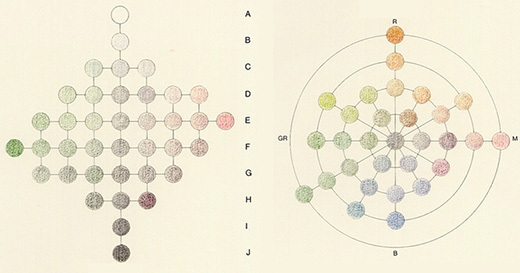 The distribution and structure — which science has now explained in detail — of the three genes for colour vision leads us to conclude that Gerritsen’s interpretation of opponent-colours and their creation is compatible with the molecular facts, implying that the polarities centred on white and yellow could therefore also be perceptual atavisms. 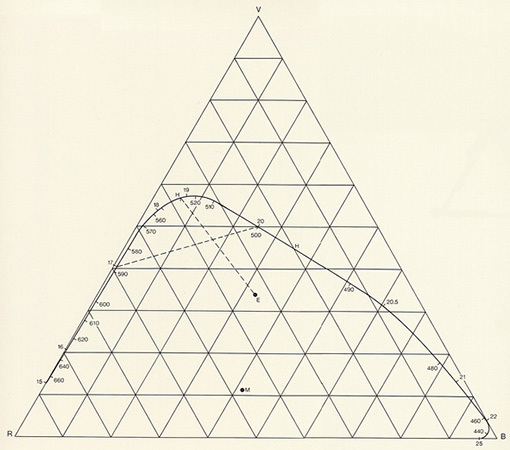 Date: The diagram, constructed according to the laws of colour perception, appeared in 1975. Basic colours: Six «full colours»: yellow, red, magenta, blue, cyan and green. 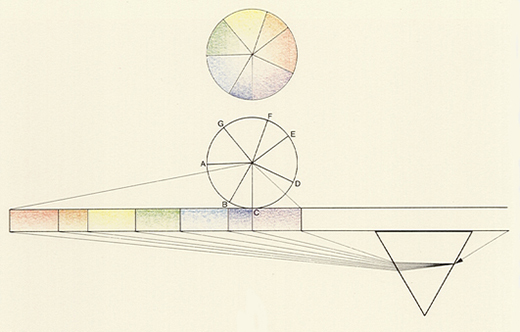 Bibliography: F. Gerritsen, «Entwicklung der Farbenlehre», Göttingen 1984.